It has been more than three years since the cornerstone was laid. During this period, roughly 700 people worked hard to build the industrial plant, which features over 40,000 square meters of built area, installed in a total area of ​​510,000 square meters – a space not translated by figures, but which is really impressive when one arrives at the place. The Gamefish kayak, produced alongside Asperbras Rotomoldagem and sports material manufacturer Freeport Sports, won the first place in the 32nd Design Award of the Museu da Casa Brasileira. The short film A Criança e o Lixo (“The Child and the Trash”), produced by the students of the 2nd stage of the Nelly Colnaghi Foundation, aged between 5 and 6 years, won the prize of the children’s category of the Se Liga Aí Festival. GreenPlac, which has green in its name, was founded with the commitment to be a sustainable business and is in the process of receiving the FSC seal by the Forest Stewardship Council (an independent, nongovernmental, nonprofit organization established to promote responsible forest management around the world). Some of Brazil’s main media outlets have highlighted the Group’s business units. GreenPlac participates in the first time at ForMóbile 2018 after its industry inauguration. The Biomass Thermal Power Plant of Guarapuava, located in the south-central region of the state of Paraná, is already fully operational. Asperbras Tubos e Conexões has taken another step in its quest for quality assurance of its products. In an audit carried out on July 26 and 27, the company reclassified its ISO 9001 certification, from the 2008 version to the 2015 one. In the midst of a big celebration, held in the city of Água Clara (MS), attended by over 700 guests, including local authorities, directors, entrepreneurs, suppliers, employees and friends from all over Brazil and abroad, the dream came true. A cidade de Penápolis, no interior paulista, onde o Grupo teve origem, é o cenário da próxima grande inauguração da Asperbras. Brazil’s main publication of the passenger transportation segment, dedicated its cover story to the Angola School Transport Program. 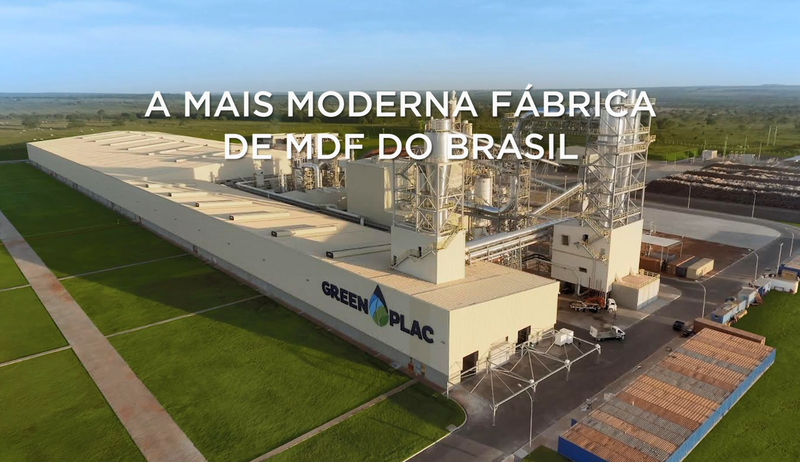 GreenPlac, the Asperbras MDF industry is due to be completed in early 2018.
with production start-up for January 2018. The group participated in the 7th edition of the Internationals Fair of Wood and Furniture Industry’s Providers, ForMóbile, an important event involving the area, having as its main goals expose its new enterprise’s project. With a great space inside one of the most important fairs for basic sanitation that happens in Brazil, Asperbras Rotomolding Industry and Asperbras Pipes and Connections, once again, showed why the company is one of the four biggest producers in the country in the segment. On its stand, the Group exposed what’s best on its products, introducing those present on Fenasan 2016 to high quality items for public and private companies. Asperbras, a company that acts in various areas which include industrial project management, constructions and incorporated real estate and agribusiness, is now concentrated in a project of eucalyptus production to supply the future MDF factory (blocks of medium density wood fiber). Practically a new neighborhood is being created in Penápolis. Counting with the proper infrastructure, well located and easily accessed, Felisa Portal das Primaveras of Asperbras Entreprises, has lands that varies between 250m² to 370m² and will allow high quality of life to families. With an expected profit of over R$ 160 millions in 2014, Asperbras is part of the G4 of greatest producers of pipes and connectors for basic sanitary in Brazil. To be part of that group, the company will process more than 30 thousand tons of PVC pipes this year.